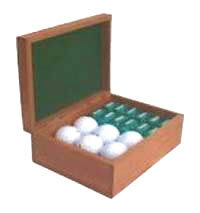 These hinged-box's are designed to hold a variety of items such as candy, or golf balls. This box includes a felt lining and is available in cherry. Available in a small medium and large size. This box is excellent for small awards and promotions. Made for smaller items. You can also get a heart shaped box like above. Includes a felt lining and is stocked in cherry. This box is excellent for small awards and promotions. Made for smaller items. You can also get a heart shaped box like above. Includes a felt lining and is stocked in cherry and walnut is available. This box is great for keeping a dresser organized. A perfect desk accessory dessigned to hold and display business cards. 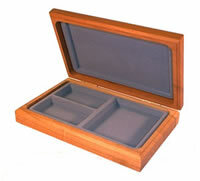 This hinged box includes felt lining and is available in walnut or cherry. Constructed from hardwood, with glass top, and brass hinges & latch. Each box is felt lined to protect your collectibles. The display case can be lasered on glass or wood. Will hold standard size business cards or other small items. Includes a felt lining and is available in walnut or cherry.